The preparation of new oxides of transition metals in unusual oxidation states (e.g. V(IV), Cr(IV), Mo(V), Fe(IV), Ni(III), Cu(III)) or intermediate valence states (like Cu(II)-Cu(III), Mn(III)-Mn(IV), Fe(II)-Fe(III)) has been our main topic of research for the last eighteen years. The mentioned oxides present strong electronic correlations which are responsible for interesting properties such as the superconductivity, the metallic behaviour and the metal-to-insulator transitions or the colossal magnetoresistance phenomenon. 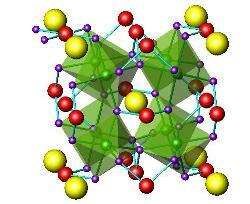 Many of these oxides are metastable and must be prepared under high-pressure conditions. 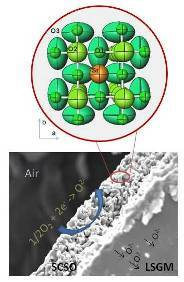 Moreover, many of the oxides that traditionally were studied from the magnetic or electronic point of view (superconducting, colossal magneto-resistant oxides…) find applications, with subtle modifications, as electrodes in electrochemical devices such as solid oxide fuel cells (SOFC). In particular, the wide family of transition-metal oxides with perovskite structure presents a rich panoply of polyvalent materials that fulfill most of the features required for mixed ionic-electronic conductor (MIEC) oxides. In the last years we have developed innovative cathode materials that have allowed us to achieve impressive performances in electrolyte-supported fuel cells. In relation with SOFC, which are fed with pure H2 as fuel, the implementation of hydrogen as energy vector requires the safe, cheap and efficient storage in adequate media. Metal hydrides are realistic candidates for such a task. Recently, our experience in high-pressure synthesis has allowed stabilizing several complex hydrides based upon magnesium. This success in the preparative protocol has stimulated the design of a new line of research, based upon the direct reaction of simple hydrides under high pressure conditions, which prevent the thermal decomposition of the reactants.